Today’s enterprise faces dramatic change and tremendous opportunity. Enterprise architects are finding it challenging to ensure adequate technology governance, drive transformational initiatives, and support critical business processes. 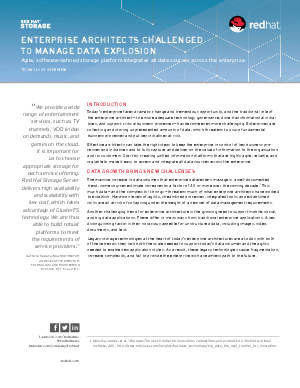 Collecting and storing unprecedented amounts of data threatens to usurp fundamental business processes and puts key initiatives at risk. Architects must take the lead in championing a future-proof data platform as digital media plays an increasingly important role in today’s mobile, social, and web environments.